Q. What made you decide on this series? A. I have been planning a major retrospective of my works for some time now. About two years ago, I started collecting my paintings from art collectors, galleries and from my private collection. Looking at them, made me feel, it would be interesting to take a fresh look at them. And, to recreate them now. Remember these paintings are also from the 60s and the 70s. In the present series, I find the forms are more defined and the detailing has also increased. Q. In general, what inspires you to paint? A. What I did yesterday inspires me today. And, what I do today will inspire me tomorrow. I draw inspiration from different sources – what I read, books, art, happenings around me, they all influence me. 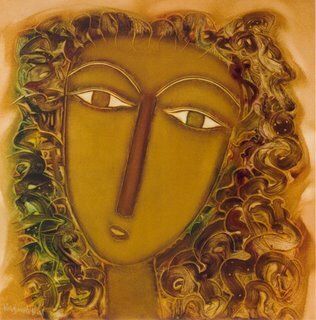 My earlier series have been inspired by poetry, where the Kalpavriksha became central to many of my paintings. Maithuna (Act of Love) was inspired from romantic poetry, Earthscape is about deforestation and the growing ecological imbalance – how people destroy themselves by destroying nature. Theatre of Life came about seeing villagers watching television through the day. Q. What is the idea behind the mask like faces? A. I feel all of us wear a mask before the world. To get to know the person, you need to go behind the mask. Whether it’s newsreaders who wear the same expression on every channel or you, we all present a mask to the rest of the world. A. My style of painting is such that oil suits my temperament. I like to finish a painting from start to finish in one go. And, I need to finish it before the paint dries. I work for about 8-12 hours a day when I start on a series. Q. Do you plan or sketch your paintings beforehand. A. No, I don’t sketch for a painting. My drawings are meant to be just that – minimal lines that give an idea about the skill and strength of an artist. My paintings evolve as I paint. I start off with an idea, but I don’t plan out the details. I build upon it as I go along. Sometimes accidental effects in one painting become intentional in the next one. Thank you for this interview with Mr. Vasudev. We are proud owners of 4 of his paintings (from 1992 and before). Can't tell you what joy it brings us to be able to look at them daily!